Nestled in the mountains near Pigeon Forge and Gatlinburg, you'll find Shagbark Resort! This premium, gated cabin community is a great place to find a cabin for your vacation! This peaceful resort community offers guests 24-hour security, an outdoor resort swimming pool, tennis courts, and basketball courts to enjoy during your vacation. Better yet, this cabin resort community is located only a short drive from Pigeon Forge and Wears Valley, so you'll have no trouble finding fun things to do on your Smoky Mountain vacation! At the end of a long day, you'll love returning to your cozy cabin in this beautiful, forested resort area that offers a peaceful place to unwind. 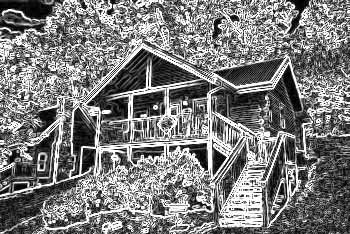 Reserve your Shagbark cabin rental with Cabins USA Gatlinburg today and save 15% on your nightly rate! Looking for a cabin near Gatlinburg with deck? "Tennessee Delight" offers guests a chance to enjoy mountain scenery and cabin comforts in the Smoky Mountains.